Disc jockey Kris Kono, a physical therapist by day, provided music for dozens of fund-raisers. Surrounded by the tools of the deejay trade, Kris Kono offered an invitation to dance and hundreds said yes, moving with joyous abandon to songs she melded so smoothly it was as if one measureless melody cascaded from the speakers. A physical therapist by day who could soothe injuries as surely as she inspired clubgoers from Boston to Atlanta and Montreal, Ms. Kono died last Monday in Brigham and Women’s Hospital of complications from cancer. She was 46 and lived in Roslindale. “Both her day life and night life were formed by bringing joy and healing to people, and I think she saw music equally as a vehicle for healing,’’ said Kristen Porter, founder of Boston-based Dyke Night Productions. Since the mid-1990s, the two worked together and Ms. Kono provided music for dozens of fund-raisers benefiting, among others, a children’s theater group and organizations that assist battered women or aging members of the lesbian, gay, bisexual, and transgender communities. As dedicated to her physical therapy patients as they were to her, Ms. Kono was a supervisor at an outpatient clinic run by New England Baptist Hospital. Previously she was on the staff of the health center at her alma mater, the University of Connecticut in Storrs. The older of two daughters, Kristine Kono grew up in Rocky Hill, Conn., where she graduated from Rocky Hill High School and was a top tennis athlete, a sport she played on the Division 1 level at UConn. Traveling with her father, Lee, in the 1980s from their home to the nightclub he ran in nearby Hartford, Ms. Kono caught a glimpse of her future in the deejay booth. “I remember standing at the edge of the dance floor completely fascinated by the deejay seamlessly blending two songs together. I said to myself, ‘I must learn how to do that.’ ’’ she told www.lesbiannightlife.com. Once she did, her father, who died several years ago, let her deejay occasionally in his nightclub. After graduating from UConn, where she studied physical therapy and sports medicine, Ms. Kono essentially pursued dual careers, day and night, in clinics and clubs. After-hours parties at Club Lucy, as Zamgochian’s basement was dubbed, soon gave way to larger venues. She spun in Provincetown, in Miami’s South Beach, and at pride parades in New York City, where she seemed to know just what music to play as the float upon which she rode rolled into each ethnic neighborhood. “Nothing made her happier than being at Machine until 2 in the morning with 800 girls dancing and singing and jumping up and down, and it was all because Kris was there creating a great, fun, happy environment,’’ said Beth Healy, a Globe reporter who was Ms. Kono’s partner. Some may have stopped to talk with Ms. Kono simply because of her smile, which was warm, inviting, and as much a trademark as the music she played. 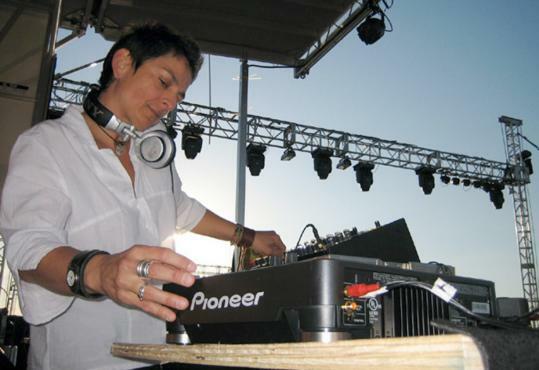 A few years ago, Ms. Kono started also deejaying for Boston Housemusic Coalition, and was as at ease in a realm dominated by men as she was hosting lesbian events. In addition to her mother and Healy, Ms. Kono leaves a sister, Diana of Natick. A memorial service will be held at 6:30 p.m. today in the Arnold Arboretum in Jamaica Plain, one of Ms. Kono’s favorite places, and where she took Prana, her Italian greyhound, to run. Little more than a year ago, Ms. Kono was diagnosed with what is sometimes called uncertain primary cancer, which can complicate treatment because its origin cannot be determined. Though this uncertainty layered emotional and medical complications onto arduous treatment, Ms. Kono greeted each day as if the sun was shining and an endless future was unfolding anew. Indeed, at a moment that consumes many with sorrow or anger, Ms. Kono felt gratitude.